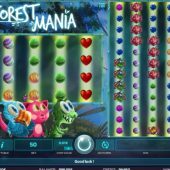 Forest Mania slot is an interesting game in that everything happens randomly! The theme is of a cartoon forest inhabited by some strange Trolls and Gremlins, some friendly and some not so, similar to IGT's Pixies of the Forest. The various fictional forest characters feature on the reels along with various forest fruits making up the lower pays. We also have a tinkling 'fun' soundtrack taken straight from any Tom And Jerry - style cartoon you may have seen. So if you go down to the woods today, will you be in for a surprise? The first obvious characteristic to point out is that iSoftBet have clearly used the 'Colossal Reels' format that you see in WMS games such as KISS and the Rainbow Riches Reels of Gold slot. This means you have a typical reel set of 5 reels and 3 rows on the left and a Colossal set on the right of 5 reels and r reels and 12 rows on the right. All have stacked symbols and you get 20 pay lines on the small set and 80 on the Colossal Reels set, costing you 50 coins. Each set pays separately. The best 5-of-a-kind only pays 5x stake and lowest a mere 0.5x stake but this is due to the multiple winning lines you can achieve. Unlike the games mentioned above, there are no Wilds appearing on the reels. These appear randomly and are placed there when a friendly Troll appears and can come in two forms - substitute Wilds whereby a symbol will be chosen at random and all instances of it on both reel sets become Wild after the spin, and Wild Reels in which 1, 2 or 3 reels on the first small reel set are transformed into Wilds and these replicate onto the Colossal Reels too, in the same way Wild Reels replicate on Kiss and Rainbow Riches Reels of Gold quoted above. The free spins also appear randomly, and are the last gift the 3 friendly Trolls have for you. 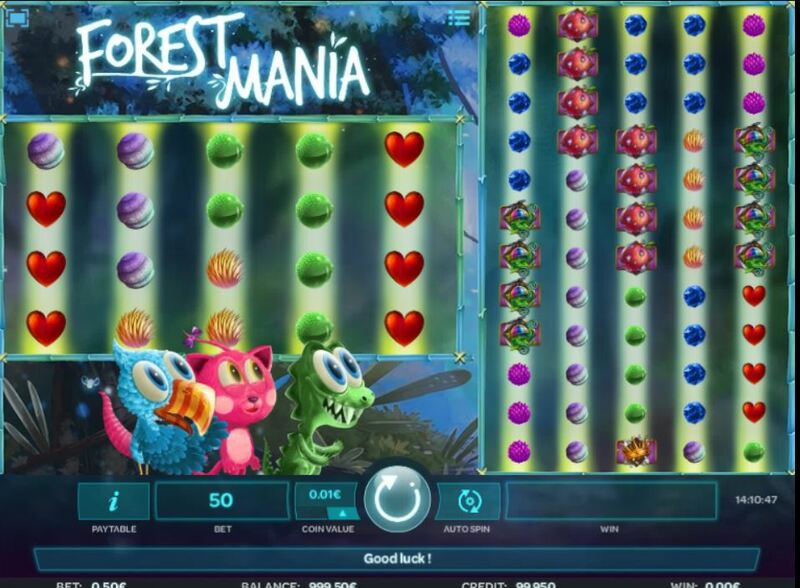 You will get at least 3 and during them the Trolls are far more likely to appear, on average every 2 spins. It is likely the first one you see will actually add a small clock to the graphics which will spin and add up to 6 more spins, so although 3 doesn't sound much it's likely you will get many more. The unfriendly Troll will try and drop heavy stones onto the nice ones underneath the first reel set which will break and become either of the 2 Wild enhancements mentioned above.